Let me begin by saying that both my mother and Brian’s mother are terrific Mothers-in-Law! Let me also say, I have two amazing Daughters-in-Law! Nikki and Jenny are literal answers to prayer because I began praying for them way back in 1987 before I ever knew them. I, on the other hand, am still learning how to be both a good MIL and a good DIL. Fortunately, I have a new resource to help me! My dear friend, Cheryl Pollock recently published a wonderful book to help all of us MIL’s do a better job of loving and building relationships with our DILs. This is a must read for every MIL or MIL-to-be (even if your child is currently a toddler). Cheryl takes on a touchy topic and handles it with truth and grace mixed in with a bit of humor. Cheryl flawlessly weaves Scripture together with real life illustrations and examples to help all of us understand and avoid the traps and pitfalls of this most precarious relationship. Her words will help us strengthen the bond that will hopefully transcend our lives. As I read through this book, I saw many things I wish I had done differently both as a DIL and as a MIL; but I was also encouraged that it is never too late to change. Cheryl gives many practical and easy-to-apply suggestions on ways to build positive relationships with our DILs. After all, these women are the wives to our sons, and the mothers of our grandchildren; we need to have respectful and loving relationships with our DILs because so many other relationships hinge on this one. Cheryl takes us through many stages of the MIL relationship; from getting to know the girl our son is dating, through the engagement, wedding, setting up their own home, having babies (our grandchildren!) and flourishing as life-long friends. I was really humbled that Cheryl saw fit to include in her book something that I did for my daughters-in-law: “The Blessing Shower”. The “Blessing Shower” was an opportunity for the women in my life, who had prayed for my sons and their soon-to-be-wives for many years, to get together and offer Godly advice and then pray over my soon-to-be-daughters-in-law. Cheryl also included the “Mother-in-Law Covenant” that I created for my girls as part of their blessing – a promise I made to my girls as they joined our family. Reading Cheryl’s book reminded me of the blessings my girls are to me! As you read it, I think you will feel the same way about your daughters-in-law! Thank you, Cheryl, for writing a much needed book for so many of us! And, thank you, Dan and Bob, for bringing such precious young women into our family! I’m eternally grateful. Below are photos of the Blessing Showers and the text of the Mother-in-Law Covenant. I hope I am living up to it. Nicole/Jennifer, it is my great pleasure to know that you are becoming my daughter. As you enter my life, I am reminded of the relationship between Ruth and her mother-in-law, Naomi. I want to be the kind of mother-in-law that Naomi was. When Ruth was given the opportunity to leave, and start a new life, she chose to stay with Naomi. Why — Because she loved Naomi, not only as her friend, but as her sister in the Lord. Ruth saw, and wanted, the God that Naomi loved. I promise never to put Dan/Bob in a position where he has to choose between you and me, whether in discussions, scheduling, family events, holidays, personality conflicts or any other situation that comes up. I promise I will never put him in a place where he must choose one of us over the other. I will never go behind your back to try and persuade his loyalty to be with me. I will openly communicate with both of you. I will uphold your relationship with Dan/Bob; I will pray that God would continue to strengthen it in Himself. You are the primary woman in his life from now on. I promise never to undermine your authority in your home. Whether it is in your choice of decorating, menus for entertaining, scheduling, working or staying home, how you clean, when you come and go, or even where you store your dishes, I will not challenge you. Your home is yours and his. I will uphold your choices and decisions. And, I will encourage you to be bold in exerting your preferences over others. I promise never to undermine your parenting (should the Lord bless you with children). I will uphold your authority to raise your children, parent them, school them, and discipline them as the Lord leads you. And, as their grandmother, I will defer to your guidelines, and encourage your children to honor and obey you. Nicole/Jennifer, I will pray for you, love you, and welcome you into my home, my life, and my heart. I will encourage you, support you, and defer to you in your relationship with Dan/Bob, and with your future family with him. I will support and encourage your relationships with the other women in your life, especially your mother and sisters. I will never try to undermine those relationships or take their place, and will pray for the Lord to strengthen them. I promise, as your mother-in-law, to try to set the best example of what a Godly woman looks like, so that you will see in me, a mentor, friend, and mother. I am so blessed to have you as my daughter! We are so blessed to know each other in a christian relationship first and a family second. One day at a time. Got it. I just looked at this on my cell phone this morning and it was sorta tunnel vision. haha. Now that I see it on the computer screen, I see that it was meant for DIL’s. Just didn’t see it clearly. Good to know that there are different scenarios that can apply to SIL’s too. I think I will get this book! Thanks for your response and Cheryl’s. Love you! Thank you for your question! 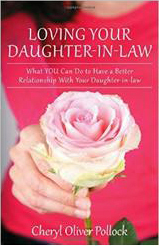 I’m a boy mom so the book is written from that perspective but many of the principles included could be applied to a mother-law/son-in-law relationship as well. This was great. I will have to read to see what is says for the Christian MIL who has not ways been a strong Christian. The guys I have dated seem to have those types of mothers. Like Jesse’s parents allowed her kids to move in with their significant others such a different life from what I know. That is over. I’ll share more when I talk to you next. Cynthia,.. I’ve asked Cheryl to respond directly to your question 😉 she’s traveling today, but will get to it soon. Hi Cynthia. The book is written from the mother-in-law’s point of view but, I believe my thoughts could be applied to many situations. I’m not sure you are asking for my advice but a couple of thoughts plopped into my brain that may be helpful. The first thing I would do is pray, pray, pray! Ask the Holy Spirit for His guidance and His words. Then be a godly example. After prayer, perhaps God’s Spirit will open up an opportunity for you to speak to this mother-in-law about this particular concern. If she is a new believer, she may not even know that God has set certain boundaries (like that of being married before we live together) for our protection and provision. His boundaries protect the sweetness of our fellowship, our communication and closeness with Him. Then I would do what you have just done……I would ask for the counsel of mature believers and then pray again! :). Thanks for your comment! How encouraging! Thanks for writing this Marcia. It was wonderful to read the Blessing you wrote and read from your heart to your new “daughters” and glean from this Blessing! I look forward to reading Cheryl’s book! As you know, we have 5, D-I-L’s & I, S-I-L. I need to read this book! I love you, Marcia! You are a blessing to me.